The Crenshaw Cougars (9-5) could not surpass the Narbonne Gauchos (12-2) in the Division I city section title bout. The gauchos beat the cougars 57-21. Although Crenshaw had moments of sound defense, the Narbonne offense completed key passes that led to touchdowns. Crenshaw came into the game outnumbered; their 37-member squad went up against Narbonne’s 81 members, according to Max Preps. The gauchos were the first to score a touchdown early in the 1st quarter. Narbonne kept Crenshaw from scoring and earned another touchdown. Crenshaw would fumble the ball, allowing Narbonne to gain another possession. 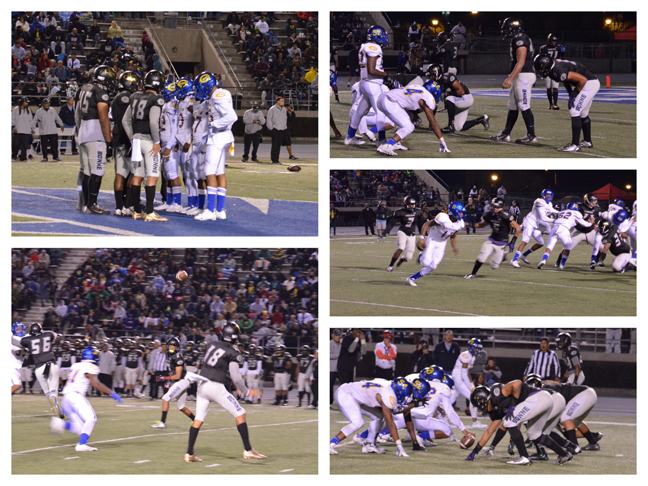 The gauchos denied the Cougar defense by passing the ball, this tactic plagued Crenshaw throughout the night. Narbonne gained yards and 1st downs through plays made on their third or fourth down, pausing for extended periods of time before snapping the ball. The Gauchos earned another touchdown late in the first quarter with a completed pass by wide receiver Devaughn Cooper. Crenshaw struggled to score, after losing possession due to a fumble. Narbonne fumbled also, giving the ball back to the Cougars. Crenshaw created a 7-point play early in the second quarter. After Crenshaw punted, Cooper would commit a 53-yard return. With 8:28 left in the second quarter, Narbonne earned another touchdown and boosted their score up to 21-7 against the Cougars. Narbonne intercepted Cren­shaw’s ball twice; the second time resulted in the Gauchos earning a touchdown and a two point conversion, improving their score 29-7. Crenshaw was unable to score for the rest of the quarter; however, Narbonne continued their offensive rampage by leading 36-7 over Crenshaw at halftime. Early in the second half, Crenshaw did not earn points from their possessions. Narbonne made two more touchdowns. Running back Sean Riley scored a 46-yard touchdown and Kameron Denmark scored a 48-yard touchdown pass. Crenshaw quarterback Daiyan Henley refused to quit and scored two touchdowns, notching the Cougars up to their final score. Narbonne will face the undefeated Ridgeview High School (13-0) on December 12. In Division II City Section finals, third seed Fairfax (8-6) gave Los Angeles High (12-1) their first loss of the season with a 31-16 victory. Running back Ramses Hernandez carried Fairfax on his back, giving the team four touchdowns, according to MaxPreps. Belmont (14-0) defeated Holly­wood (12-2) in the Division III championship game 24-7. Running back Isaiah Chatman rushed 31 times for Belmont. Hollywood quarterback David Rothenberg completed nine passes. The Belmont squad made history by earning the high school’s first city title, according to the LA Times.